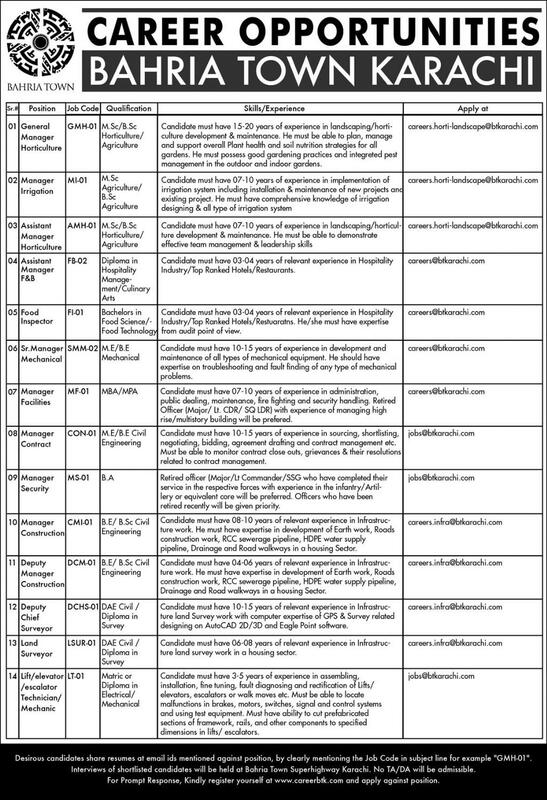 Jobs Description: Bahria Town Karachi Jobs March 2019 are listed below in our site. Bahria Town Karachi recently announced an advertisement for Jobs of General Manager Horticulture, Manager Irrigation, Assistant Manager Horticulture, Assistant Manager F&B, Food Inspector, Sr. Manager Mechanical, Manager Facilities, Manager Contract, Manager Security, Manager Construction, Deputy Manager Construction, Deputy Chief Surveyor, Land Surveyor, and Technician. Bahria Town Karachi has required the applications for the following jobs.